Yes! It's the long awaited guest post from Jill over at Simple Daily Recipes! Actually, she wrote it and got it to me about a month ago. I'm the slacker who hasn't had time to try the recipe and post about it until now. Jill is one of those types of cooks I want to be when I grow up. She moves effortlessly between good ole down home comfort food and really sophisticated techniques and ingredients. Plus- she's really good about posting to her blog everyday, and I'm so not like that. Here's the fennel recipe she wrote for me. I challenged her to write a recipe that would make me love fennel. I don't like fennel. But I want to love fennel. It's so pretty and exotic looking. Anyhoo- this is what she came up with, and there's a steaming batch of it simmering away on my stove top right now. I'll do a separate post on the results. So- take it away, Jill! Just so you know, I've never eaten fennel in my entire life. So when Mimi challenged me to make a recipe with fennel that would help her love it, I was more than interested to see if I could love fennel, too. 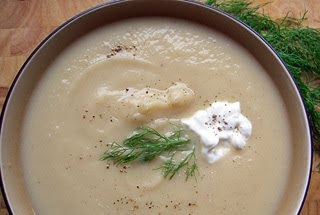 After searching through several trusted cookbooks, I settled on making Fennel Soup. Now, fresh, uncooked fennel has a mild licorice taste. That was something I had to push past because I've never liked licorice. I kept chopping and prepping and telling myself to just give it a chance. There were plenty of other ingredients in this recipe that I knew I liked and it couldn't turn out to be all that bad. It turned out pretty good! Smooth, creamy, more like a potato soup with hints of fennel in its finish. I couldn't help add an extra pinch of fresh ground pepper to my own bowl, just to give it a little heat. A small dollop of sour cream stirred into the soup adds a nice touch to it, too. In a medium saucepan over medium low heat, cook fennel, onion, and fennel seeds in chicken fat, until tender, 7 minutes or so. Yes, I said "chicken fat." It's a wonderful flavoring agent and when rendered from a pasture raised organic roasted chicken, it's good for you. Pour in the hot chicken broth, (this speeds up the cooking time), add the potatoes and garlic, pepper and salt to taste. Cover and cook over medium low heat for 15 minutes, or until potatoes are tender. Remove from heat. Using a hand held blender, puree the mixture until smooth. If it's too thick, add a little more hot chicken broth or water, until it has a smooth soup texture. Serve in warm bowls topped with a dollop of sour cream. Thanks, Jill! Like I said, I have a pot of it simmering away on the stove right now. We got about 3 inches of snow last night, and it is continuing to dump on us this afternoon, so Dev is pretty excited about home made soup for lunch. All three of the people who read my blog should go to Jill's blog RIGHT NOW and look at all the yummy-scrumptious stuff she has on her really cool, professional looking blog. And thanks again, Jill for sending me a recipe that might just make me fall in love with fennel!